Clackamas' Alex Claxton hit a two-run triple to cap a four-run seventh inning that lifted the Cavaliers to a 7-6 victory over the Moorpark (Calif) Musketeers in Monday's opening game of the Pride Classic high school baseball tournament at Arizona Christian University in Phoenix. The Cavaliers trailed 6-3 when Jeff Nelson got hit by a pitch to lead off the seventh, advanced to third on Kaiden Miller's double to center, and scored on Jack Dollens' ground out to second. Grant Schoen followed with an RBI-single that scored Miller, Brody Upton reached on an error, and then Claxton drove a 1-1 pitch from Moorpark reliever Greg Pimentel into center field for a triple, scoring Schoen and Upton to put Clackamas in front, 7-6. Moorpark put the potential tying run on base when Troy Anderson reached on an error, and then Scheon, pitching his first inning in relief of Clackamas starter Nick Vaughn, retired the next three Musketeers on two ground outs and a fly out to seal the win. Vaughn worked the first six innings and allowed six runs (three earned) on six hits with one walk and six strikeouts. EAGLE (ID) 11, CLACKAMAS 9: Eagle sent 11 batters to the plate in the sixth inning and scored six runs on six hits including Dalton Mashore's three-run homer and Cannon Morgan's RBI-triple as the Mustangs turned a 9-5 deficit into an 11-9 lead. Clackamas' Jack Dorn led off the seventh with a single and Brody Upton drew a one-out walk to put the potential tying runs on base before Eagle reliever Dawson Warner struck out Alex Claxton and Nate Vaughn to end the game. Jackson Jaha went 2 for 2 with two doubles, two walks, and three runs scored for the Cavaliers, who trailed 5-4 before scoring two runs in the fifth and three in the sixth to take a 9-5 lead. MILWAUKIE 11, ROOSEVELT 3: Dustin Hyatt, Logan Killian, and Kaden Middleton had three hits each and Peter Foulke added a three-run homer to highlight a 15-hit attack that carried the Mustangs to a win over the Roughriders in the Portland Interscholastic League tournament at Milwaukie's Lake Road Sports Complex. Hunter Entrikin started for Milwaukie and pitched the first 3 2/3 innings, allowing two runs on three hits with four walks and three strikeouts. Owen Wadman then threw 2 1/3 innings of no-hit relief with one walk and three strikeouts, while Jake Delamater worked the seventh, allowing one run on two hits with two strikeouts. PUTNAM 3, ROSEBURG 2: K.J. Ruffo's one-out single scored Sam Sholty with the game-tying run in the seventh inning, and then Tanner Drog's single delivered Ruffo with the game-winning run as the Kingsmen rallied past at Pendleton's Buckaroo Classic tournament at Blue Mountain Community College. Putnam starter Nick Geertsen went the distance, allowing two runs on five hits with two walks and six strikeouts. Travis Varner, Drog, and Ruffo had two hits each to lead Putnam's eight-hit attack. NORTH MEDFORD 13, LA SALLE PREP 3: North Medford's Ryan Sandoval went 3 for 3 with two home runs and four RBIs to key an 11-hit attack that powered the Black Tornado to the blowout win over the Falcons at the Buckaroo Classic tournament in Pendleton. North Medford jumped on La Salle early, scoring six runs in the first and two in the second to take an 8-0 lead. The Falcons got a run back in the second and two in the third before the Tornado piled on with three runs in the fourth and two in the fifth. La Salle's Matt Evans and Nolan Grogan had two hits each and Patrick Raschio added an RBI-double for the Falcons. CLACKAMAS 12, SANTA BARBARA (CA.) 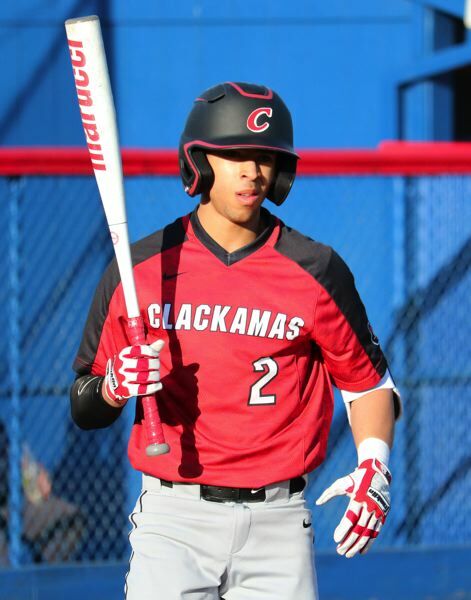 12: Clackamas' Brody Upton went 3 for 5 with a two-run homer and finished with four RBIs as the Cavaliers got into a slugfest with the Dons at Mountain Pointe High School in Phoenix. Clackamas sent 15 batters to the plate in the third inning and scored 10 runs on six hits, six walks, and two fielder's choices to take a 10-1 lead. Santa Barbara rallied with two runs in the third, six in the fifth, and one in the sixth to forge a 10-10 tie. In the seventh, Justin Gonzales led off with a double and then Upton hit a home run to left field, putting the Cavaliers back on top, 12-10. The Dons answered in the bottom of the seventh as Moses Dokes drew a one-out walk, Derek True reached on an error, and both runners scored on Nick Dallow's double to left. PUTNAM 6, DAVID DOUGLAS 5: K.J. Ruffo went 3 for 3 with two doubles and a triple, and Vinny Salvione added a two-run double in a five-run fifth inning that lifted the Kingsmen to win over the Scots in the Buckaroo Classic tournament in Pendleton. BUCKLEY (CA.) 9, GLADSTONE 8: Buckley's Wyatt Miller led off the sixth inning with a single and came around to score the go-ahead run on Leo Bristow's ground out to shortstop, lifting the Griffins past the Gladiators in the 45th Annual Anaheim Lions Baseball Tournament at Boysen Park in Anaheim, Calif.
Gladstone's Mitchell Kuhn went 2 for 3 with a double and Jake Gehrke added an RBI-triple for the Gladiators. MILWAUKIE 20, BENSON 0: Kaden Middleton went 2 for 5 with two triples and four RBIs, and Nick Cooper and Logan Killian added two hits each as the Mustangs overwhelmed the Techmen in another Portland Interscholastic League tournament game at Milwaukie Lake Road Sports Complex. Middleton drew the start and threw three no-hit innings with one walk and seven strikeouts. Cooper and Nico Gatson mopped up, limiting Benson to one hit in the final two innings of a game that was abbreviated to five innings.